How did we get the “Lost Treasure of Jerusalem” out of this clue? Well, it seems to be part of the “mythicization” process going on here: a connection between the last of the Merovingian kings and Sion/Zion. Going in another direction: local traditions in Rennes-le-Chateau have persistently referred to treasure of one sort or another in the region. In the first place, the area itself is rich in minerals: lead, silver, copper and gold have been mined there since Roman times. It is said that, in the 12th century, Bertrand de Blanchefort, Grand Master of the Knights Templar, whose castle stood within sight of Rennes, brought laborers from Germany to work in his mines. The people of the Middle Ages believed that the precious metals extracted from the Blanchefort mine came, not from a vein in the rock, but from a store of gold and silver ingots buried in the dungeons of the fortress by its first masters, the Visigothic kings. Then there is the report that a slab of gold weighing almost 45 pounds was found near Rennes. It was said to be made from fused Arab or Crusader coins. An ingot of gold weighing 110 pounds was found shortly after. In 1928, what was left of a large gold statue was found in the ruins of a hut on the edge of the stream that flows below Rennes; it had been partly melted away, but its feet were still clearly distinguishable. The idea of treasure, then, is clearly established, and most likely based on some foundation in fact! The question is: what treasure is it? And, where did it come from? Well, in this story, we have some intrepid mythmakers busily connecting the idea of treasure in the Rennes-le-Chateau region to Sion and the Merovingians. And, one question we have to keep in mind is this: were they creating this “myth” for their own entertainment, or other personal purposes (such as political), and, if so, were they being “used” to create this myth by some other “source?” What I mean to say is this: when a person is involved in a creative process, they connect in some way to “other realms,” or so it often seems. In such a case, a person could be fully convinced that they are merely writing “fiction,” when the source of the inspiration has an altogether different agenda! The writing of fiction is often a cover for the deepest of truth! Over the past 2000 or more years, four major cultures have flourished in the region and, it seems, all four of them had a singular preoccupation with gold: Celts, Romans, Visigoths and the “People of the Languedoc.” We will go further in the discussion of these peoples at some other point, suffice it to say that very little Celtic gold has ever been discovered and that is probably because the Romans got most of it and “recycled” it. But, the Visigoths MAY present us with a bit of a puzzle. In A.D. 69, Titus Flavius, the elder son of the emperor Vespasian, led a campaign against the Jews who were in revolt against the Romans. In September of 70 A.D., he took Jerusalem and sacked the temple, supposedly taking the silver trumpets, the Ark of the Covenant, the golden table of the shewbread, and the great seven branched candlestick described above. It should be noted that a talent of gold was some 110 pounds. The triumphal arch of Titus in Rome clearly shows this object being carried from the Temple, and it was taken to the Temple of Peace in the forum of Vespasian. What happened to it? Well, one story says that it fell from the Milvian bridge into the Tiber in 312 A.D. Another story says that Alaric the Visigoth carried it off when he sacked Rome in 410 A.D. The third story says that Gaiseric the Vandal took the treasure of the Temple in 455 A.D. and carried it to North Africa. Then, the byzantine general Belisarius retrieved it and took it to Constantinople where it was put in a Christian shrine from whence Justinian restored it to Jerusalem. Then, the Persians sacked Jerusalsm in 615, and nothing has been heard of the treasure since. Now, Alaric the Visigoth died right after his sack of Rome, and his successor, Ataulphus, led the Visigoths to Southern Gaul and Spain where they settled. It was well known that they possessed a lot of booty from their sacking and marauding and being paid tribute NOT to sack and maraud! They also possessed a great deal of personal jewels of the kings. This treasure was kept in two parts; one at Toulouse and the other at Carcassonne. When Clovis, king of the Franks, threatened Carcassonne in 507, the treasure there was removed to Ravenna, and later returned to the Visigothic king Amalaric. Part of this treasure was taken by the Franks when they captured Narbonne in the seventh century, but the major part of it was taken to the Visigothic capital of Toledo, Spain. When the Moors took Toledo in 711, it was known that they captured part of the treasure, but much of it was lost until the 19th century when it was discovered in a hoard at Guarrazar, not far from Toledo. This find included nine votive crowns of gold ornamented with sapphires. But, the great golden candlestick of the Temple was never found or recorded to have been found. We are not here interested in analyzing these stories to find out which one is or is not true, or if the truth of the circumstances surrounding the loss of the Temple treasure are something else altogether, we are mainly interested in the myth making going on. We have here, clearly, the idea of “treasure” that is connected to Sion/Zion, from some old sources. This treasure is connected, in a roundabout way, to the Visigoths and Franks, but mostly because they stole it. In our NEW myth form, we have the treasure BELONGING to the Merovingian Franks. And that leads us to another step in the making of the myth. Henry Lincoln found the idea of the Lost Treasure of Jerusalem possibly having found a home in the Rennes-le-Chateau region quite intriguing, and he decided to make a television show about it. After some preliminary work, Mr. Lincoln and his director, Andrew Maxwell-Hyslop, made the trip to Rennes-le-Chateau to check the layout for writing and filming purposes. Henry also wanted to check out the atmosphere. He made a number of very curious observations (you are going to have to read the book to find out all of them!) and a VERY strange discovery. Henry and his director decided to check out many of the sites related to the Rennes-le-Chateau story, including the nearby village of Rennes-le-Bains. This location once served as a Roman spa because of its hot spring and mineral rich waters and it is also where the purported “Devil’s Armchair” described by Gerard de Sede is to be found as well as a spring called “La Source de la Madeleine, which was connected to the story as one of the clues. As soon as I see it, I know that this is not La Source de la Madeleine. However, as I am here, I decide to photograph it. I take one shot, but the light is bad and the angle worse. There is a large rock beside the river into which the spring flows. I clamber onto the rock – and find myself confronting my first independently discovered piece of local ‘evidence’ in support of the story as reported in de Sede’s Tresor Maudit. The book had implied some sort of ‘liaison’ between Sauniere and Emma Calve, a wold famous prima donna of the period. And here unexpectedly, at the Lovers’ Fountain, I find that the rock onto which I have climbed bears a classic lovers’ inscription – a heart transfixed by an arrow. Beneath it – E. Calve with the date 1891. Strange. 1891 is the year of Sauniere’s alleged discovery of the parchements. It wasn’t until a year or so later, apparently, that he met Emma Calve. Even so, the inscription is a charming link with the story. I take photographs and, very pleased with my little discovery, I call Andrew to look at it. He is as pleased as I am and suggests that we return tomorrow, time permitting, to re-photograph when the light will be better. This incident at the Fontaine des Amours is to prove rather more significant – and even disturbing – than we imagine. It is to be the first evidence that our movements are being watched. And the watching eyes, it seems, are unfriendly and even unscrupulous. Our return visit produces a shock. The inscription is no longer there. It has been hacked from the rock. My photograph is the only evidence that the inscription ever existed. Not only is this incident a clue that our fearless filmmakers were being watched, but also that the story as de Sede presented it was NOT supported by the evidence! But, we will get to that later. Now, doesn’t it strike you as strange that Abbe Sauniere was carving this date so freely in 1891? Oops! Did I assume that he carved the name E.Calve along with a heart and date on the rock by the Lover’s Spring? Well, isn’t that the way it usually happens? The man carves a heart and the woman’s name and the date? At that period of time, women were not generally the carvers of hearts in stone to which they signed their own names! But, we will come back to that later. Yes, we are finally going to LOOK at the Shepherds of Arcadia! … investigators have brought out the role of the creative personality, of the “artist,” in the invention and development of epic poetry. 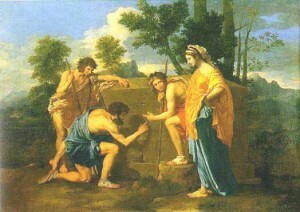 We know the ostensible story, as given by Gerard de Sede, includes the interesting statement that, during Abbe Sauniere’s stay in Paris after purportedly discovering the parchments, he spent much of his time in the Louvre, where he bought reproductions of three apparently unrelated paintings: nicholas Poussin’s “Arcadian Shepherds,” David Teniers’ portayal of Saint Anthony, and a portrait of Pope St. Celestine V by an unknown artist. We are also told that he spent a number of nights in the cemetery of Rennes-le-Chateau ereasing the inscriptions on the two memorial stones from the grave of Marie de Negri d’Ables. Of course, we later learn that, (serendipitously led to this discovery by the clever Gerard de Sede), the stones had been copied and reproduced in the “rare” book by Eugene Stublein, Pierres gravees du Languedoc, so felicitously deposited for our edification in the Bibliotheque Nationale; realizing with our hindsight that this book was SO rare that it probably never previously existed! The stone on the right supposedly stood upright at the head of the grave, and is now “lost.” It is said that, “even during a period of time when monument masons were notoriously careless about their work, this stone is remarkable for it errors.” Of course, we must keep constantly in mind the fact that the only reason we are able to look at it is becaue it was so handily reproduced in the deposition in the Bibliotheque Nationale of a book whose validity is very much in question. The stone on the left lay horizontally at the foot of the first, and it survives, though it is now blank and, according to reports, serves as the cover of an ossuary in the north-west corner of the Rennes-le-Chateau cemetery. The painting shows three classical shepherds and a shepherdess standing before a bulky sarcophagus/tomb. One of the shepherds is pointing to the words carved on the face of the tomb which say, again, “Et in Arcadia ego.” In point of fact, the finger of the shepherd is directly on the “R” of “Arcadia,” which manages to highlight the “RC” combination, which could be taken as a “sign” pointing to the Rose Cross, or Rosicrucians. Now, the curious fact is that there WAS a tomb found less than 6 miles from Rennes-le-Chateau, on a rocky mount beside the road, which certainly LOOKED like the tomb in this painting! It had no inscription on it, being covered with a thin layer of cement, and, as of this time, I understand that it has been removed altogether to prevent a continuing onslaught of treasure hunters from trampling about on private property. However, it was later shown that this was a tomb of very late construction and could not have been the model for Poussin’s painting. But, we will get to that later. Nevertheless, it is interesting to note that this “tomb” lay within the parish boundaries of the village of Arques.